After days of protests led by students and opposition forces, Venezuela's President Nicolas Maduro has ordered the expulsion of three US consular officials whom he accused of conspiracy and meeting students involved in anti-government protests. Maduro did not identify the US officials, but pledged that the Venezuelan foreign minister would give more details later. "It's a group of US functionaries who are in the universities. We've been watching them having meetings in the private universities for two months. 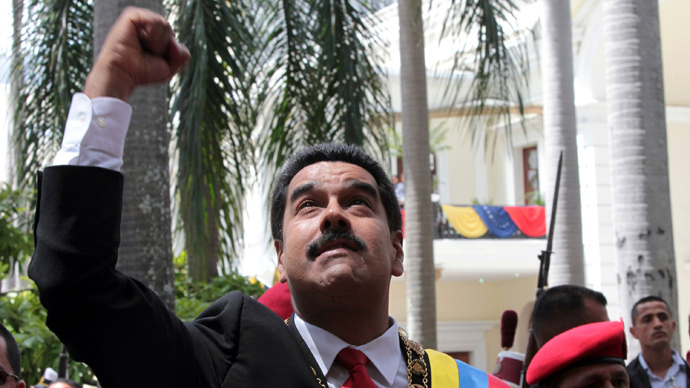 They work in visas," Maduro stated in a nationally televised broadcast. It's believed that the expulsion has been provoked by the Obama administration's support for the Harvard-educated opposition leader Leopoldo Lopez, whom Maduro accuses of leading a US-backed "fascist" plot to oust the socialist government. Forty-two-year-old Lopez (who was the mayor of the Chacao Municipality of Caracas from 2000 until 2008) has led the biggest demonstration yet against Maduro's 10-month-old government, when over 10,000 people poured onto the streets on Wednesday to peacefully protest their growing worries, such as the country's high murder rate and a record-breaking 56 percent inflation. According to Maduro, a US State Department official said in a phone conversation with Venezuela's ambassador to the Washington-based Organization of American States that arresting Lopez would cause serious negative consequences with international ramifications, AP reported. 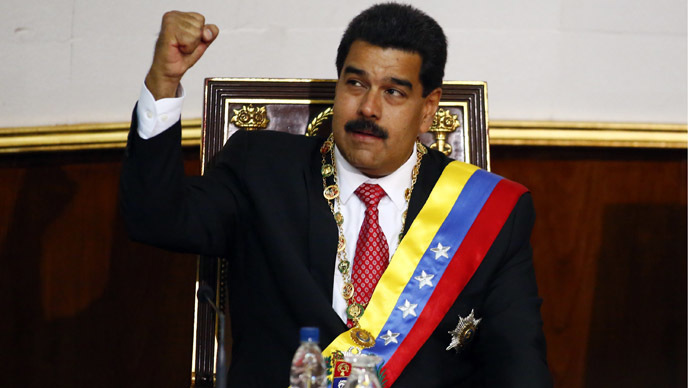 "These are unacceptable, insolent demands," Maduro said during a televised address Sunday night. "I don't take orders from anyone in the world," he added. There has been no immediate reaction from Washington, which has denied the accusations that the US has been busy plotting with the opposition against Maduro. The US hasn't had an ambassador in Caracas since 2010. Maduro's government accused Lopez of inciting violence when at the end of opposition protests in the capital a group of students battled with security forces and pro-government militias, leaving three people dead. Shortly after the incidents an arrest warrant was issued against Lopez. On Sunday, after Venezuelan security forces raided the homes of the opposition leader and his parents, Lopez posted a message on Twitter, and a three-minute long video. "Maduro, you're a coward," López wrote. "You're not going to force me or my family to bow down." Meanwhile, the raids wrapped up another night of protests during which security forces fired tear gas and rubber bullets to break up a group of about 500 students who vowed to remain on the streets until all arrested anti-government demonstrators are released, AP reported. More protests took place Sunday, according to authorities 18 people were injured. López said on the video that he invited his supporters to join him on a march on Tuesday from Venezuela Square towards the Justice Ministry building, which has become a "symbol of repression, torture and lies." He said he didn't fear arrest and accused authorities of violating his constitutional right to protest Maduro's government. "I haven't committed any crime," Lopez said. "If there is a decision to legally throw me in jail I'll submit myself to this persecution," adding that after Tuesday's march to the ministry he planned to walk alone to the agency to deliver a petition demanding a full investigation of the government's role in the deaths. In his TV address, Maduro also called for a march by oil workers on Tuesday, beginning at the same central plaza in Caracas where Lopez is planning to rally. He urged Lopez to negotiate his surrender for his own safety, claiming that some sectors of the extreme right-wing want to assassinate opposition leader to provoke a political crisis. In an effort to hamper anti-government demonstrations, which have been held since Wednesday, Maduro ordered the suspension of subway and bus service in the area where the protests take place in Caracas. 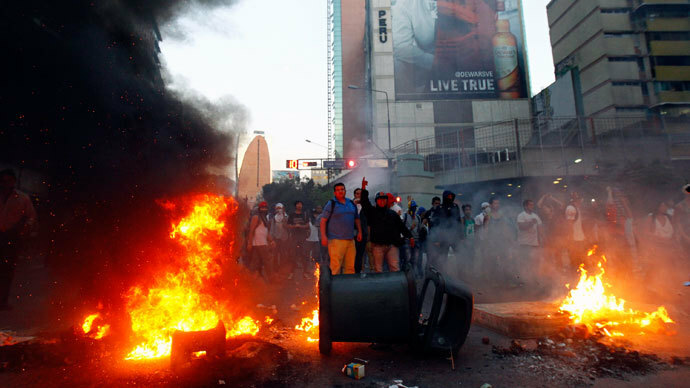 US Secretary of State John Kerry issued a statement expressing concern about escalating tensions in Venezuela. "We are particularly alarmed by reports that the Venezuelan government has arrested or detained scores of anti-government protestors and issued an arrest warrant for opposition leader Leopoldo Lopez. These actions have a chilling effect on citizens' rights to express their grievances peacefully," the statement informed on Saturday. It's not the first time the socialist leader has expelled American officials from office. Hours before announcing the death of Hugo Chavez in March, Maduro expelled two US diplomats, claiming the United States might have been behind the leader's cancer. Six months later, on September 30, Maduro said that the top US diplomat in the country, Charge d’Affaires in Venezuela Kelly Keiderling, along with two other American diplomats had 48 hours to leave the country for allegedly helping opponents sabotage the electrical grid. 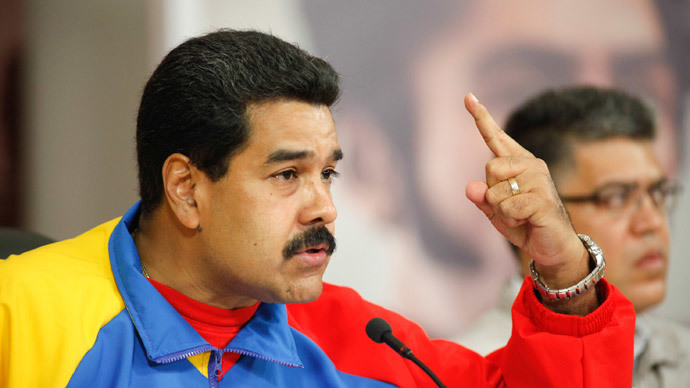 Sunday's expulsion is the third by Maduro. Venezuela's President has repeatedly claimed that the United States is determined to topple him.